This report and subsequent video analysis attached will be divided into two parts. The first part here is for the first day, Monday 1/28/2019. Part II of this report is included on a separate news release, and is for Tuesday, the next day, (1/29/2019) when the presiding Judge had a medical emergency after the morning session. Military Court Judge, Colonel Parrella had to be air-lifted from GTMO to a stateside hospital. The emergency was a detached retina. The remaining trial days were then postponed until Mid March because of not having an alternate judge to take over according to the DOD. The transcripts from the two days are now out and Leonard Bacani and myself have made a decision to bring these transcripts to the public for their perusal. C-VINE News is filled with volunteers from the public (many who are licensed private investigators, attorneys, retired police and military). It is through our combined efforts of expertise that we have been able to come up with this analysis. Session was called to order starting at 0911 Cuba Standard Time. All Defendants were present in the first morning with their defense counsel. One of the defense counsel for defendant al Baluchi, (Captain Andreu) was sick and did not appear. Defense counsel Mr. Connell was in attendance to represent the defendant. Representing the United States were 7 attorneys, two paralegals, and two Special Agents from the Federal Bureau of Investigation. Brigadier General Martins, advised that these proceedings were being transmitted via CCTV to locations in the Continental United States pursuant to the Commission’s order. The Judge advised the Defendants that they were free to be present and if they chose not be present in the courtroom, it must be of their own free will, but warned that any potential absence could be a detrimental in their ability to collaborate with their defense council. The Judge asked each Defendant individually if they understood their rights. Each Defendant said “yes”, however bin al Shibh speaking in English responded, “As I told you last time, I cannot answer your questions because you are not qualified judge for this case… thanks”. The Judge addressed bin al Shibh concern that while counsel in the past have, and are free to challenge the judges qualifications to preside over the commission, Mr. bin al Shibh is not. NOTE: Additional concerns observed by the Judge about courtroom safety were discussed and is addressed in the C-VINE Video attached. Leonard Bacani noted that the Military Judge is a Colonel in rank, but one of the Defense Attorney’s is a Brigadier General. The Defense Attorney outranks the Judge in a Military rank structure. Court was recessed soon thereafter and noted to be exactly 17 minutes after convening at 0928. The session re-convened at 1007. All parties who were present when the commission recessed were again present, with the exception of the prosecution team which departed the courtroom. Members of the Special Review Team, made their appearance by CCTV. A former Defense team member for Walid bin Attash, gave a statement to the Judge alleging, “rough surveillance”. In his Ft. Hood Texas neighborhood, the team member observes someone openly taking pictures. The remaining part of this section is worthy to be placed in a Hollywood Spy Movie and will be discussed in the attached video. Mr. David Nevin/Defense Attorney for KSM alleged Accusations of government over-reach. Investigative abuses. Long interrogations. Subjugation of multiple polygraphs and years of torture including complete incommunicado for his client. This is a new dawn in news reporting where transparency is essential. No one or two persons or entity should be in charge of dictating or deciphering what is happening here. Multiple eyes on target with these proceedings will be essential to keep the final determinations honest. The horrific happenings of 9/11 has affected all of us in some form or another. Some of us were affected in a very personal way. Some lost their lives, or that of family and friends. “We the People” are ultimately the victims. Our job at C-VINE will be to bring you the information in whole that is allowed by the DOD and follow up analysis from those with the appropriate experience to voice their thoughts and background. All information will be staunchly guarded against any hijacking of discussion, grandstanding or trolling. 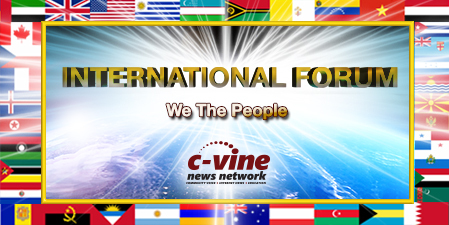 As a final reminder… we will are holding discussions and allowing posts on our C-VINE International News Facebook Group page CLICK HERE. We all work together with our various backgrounds of expertise to decipher and investigate these proceedings.